You can feel it the second you set foot in any office space or corporate headquarters. In every place of business, there is that intangible atmosphere; an inescapable, all-encompassing emotion, better described as the corporate culture, that permeates all aspects of life within the organisation. The question facing business leaders at every turn is this: How can I ensure that the culture of my company is one that encourages happiness, growth, creativity, and longevity? The answer, as many businesses are finding out, is a program known as The Oranges Toolkit. What happens when negativity becomes optimism? Negativity in the workplace can have effects far beyond the relatively simple experience of a negative emotion. When employees are happy and engaged in their work—when they believe in what the company does, what they are doing to help the company achieve its goals, and in the things they do to help their clients get what they want and need—a myriad of positive outcomes come to light. Seventy percent fewer safety incidents, an over-40 percent reduction in absenteeism, and an over-20 percent increase in profitability are just some of the benefits revealed in this workplace study conducted by the Langley Group. How can the Oranges Toolkit help? The Oranges Toolkit helps your business experience these dramatic rises. The name itself, ORANGES, is an acronym. It stands for Optimism, Resilience, Attitude, Now, Gratitude, Energy, and Strengths. The program is based in positive psychology, neuroscience, and emotional intelligence, using research conducted at leading academic institutions. The Oranges Toolkit pulls all of this together into a measurable tool that businesses can use to turn their corporate culture around. 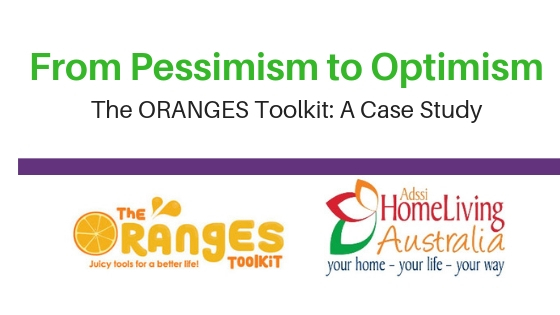 For evidence of how ORANGES works, and how it can work for you, we turn to a case study, undertaken at ADSSI HomeLiving Australia. Run out of Tuggerah on the Central Coast, a hundred kilometres north of Sydney, ADSSI HomeLiving Australia provides home-based care for older people and people living with a disability, managing a staff of approximately 150, and a client base of approximately 16,000. Jenni Allan, an accountant by background, has been CEO for the past eight years. And when it comes to her views on leadership? Why did ADSSI HomeLiving Australia need a resilience program? Those who work with ADSSI’s clients need to give top-notch, compassionate care for a host of clients who themselves face a litany of challenges based on age, illness, and injury. Factors such as emotional fatigue become an issue for the carers. This is why maintaining employee resilience, a key component of the ORANGES Toolkit, is a problem ADSSI has come up against before. People and Culture Manager Colin Henson explains. It is a challenging field, draining both physically and mentally. Being able to stay well emotionally, mentally and physically means understanding how to deal with difficult circumstances. External change is also a factor, says Jenni. In the last few years, there has been enormous change in the aged and disability care sectors. It has required service providers to change their business models significantly. But that change is not something they can influence or control. And so, both Jenni and Colin were looking for a means by which they could make sure that the challenges inherit to their industry and those brought on by external factors which might detract from company morale and do damage to their corporate culture were nipped in the bud, as it were. In the course of her search for a solution, Jenni came across the ORANGES program, and felt and immediately drawn to it. While ORANGES was introduced to ADSSI, the organisation didn’t simply jump into it. Both Jenni and Colin looked into it and make smart decisions about what to do next, before deciding it was right for them. Jenni and Colin attended an ORANGES program themselves before deciding to implement it at ADSSI. When they did decide to bring it into the organisation, they didn’t just immediately roll it out company-wide, however. Change can be difficult, even when it’s positive. So, they did it in stages — starting with their biggest champions. Colin explained how they chose the people who would participate. The ORANGES program was gradually rolled out in waves throughout the company. Though not everyone took to it, the process served as a means of weeding out those whose pessimism and resistance to change may have been a source of underlying negativity within the culture. They self-selected to leave. Once the program was introduced, it was simply a matter of adding subtle reminders of the ORANGES ethos, which Jenni and Colin found several creative ways to do. In short order, Jenni found, the ORANGES ethos became part of the ADSSI HomeLiving Australia corporate identity. Now, it’s a point of pride. The visual cues she and Colin added to the workplace serve to keep that ethos in the day-to-day mentality of everyone involved. In addition to impromptu conversations about what employees have learned via the ORANGES program, methods of mindfulness and focus have also become a regular part of company culture. Perhaps one of the most important implementations is that ORANGES is now part of the company’s language. And as if that weren’t already enough, the company’s intranet is badged with ORANGES, so that it also serves as a gentle reminder. The ORANGES program can work quickly. It’s implementable the day after an in-house training session. But it does require effort and focus to maintain, so that any positive gains don’t deteriorate over time. Positivism requires upkeep. Negative thinking takes hold when you simply do nothing at all. Jenni recommended committing to it and doing it properly. Jenni hesitated to dive into measurable results because, as she pointed out, it’s hard for her to be objective. Colin pointed out that, according to staff surveys, their numbers in 2016 in certain categories of job satisfaction were already good. Thanks to ORANGES, he says, those numbers have gone from good to great. This level of personal investment is achieved not just from what ADSSI HomeLiving Australia does, but also the value that ORANGES has brought to that work. Colin explained how the Your Voice traffic-light system allows the business to gain insights quickly, and how impactful the change has been. The traffic-light system shows you what you need to work on, by providing indicators in orange or red. For ADSSI, it was green across all of their staff sectors. Colin talked about how rare that is, even in strongly value-driven organisations. Colin explained how they have seen such a reduction in the number of Employee Assistance Program that the EAP itself called to see if something was amiss. The benefits seen by ADSSI HomeLiving Australia are obvious. But, as they rolled out the implementation of the ORANGES program gradually, so too do they recommend that you take your time. Change, when most effective, goes from the top down. Colin is quick to compliment Jenni’s leadership skills in this and other initiatives, which has led to a respect-fuelled culture at ADSSI. That civility groundswell, Colin goes on, made it easier for employees to provide input into the direction of the company. It’s also made brainstorming sessions more engaging and enjoyable. When should you think about doing ORANGES? Colin offers the suggestion that the need for change is often self-evident. Even though making a change is rarely easy, the reward is worth the struggle. He says that if your staff are tired, or worn out, it’s time to bring in fresh tactics. But he also warned against bringing in ORANGES to fix the unfixable, or for trying to make it fit if you’re not open-minded. In the end, ADSSI, and its CEO, couldn’t recommend the ORANGES program highly enough. You can find out if ORANGES is for you by attending the first public program in Adelaide, on 22-23 October 2018. Places are limited! Click here for more information.